I inked my two patterned papers to create my card base, and ran a length of Licorice Seam Binding. I stamped and colored sweet Emma and cut her out using the Emma Sweet Cut. 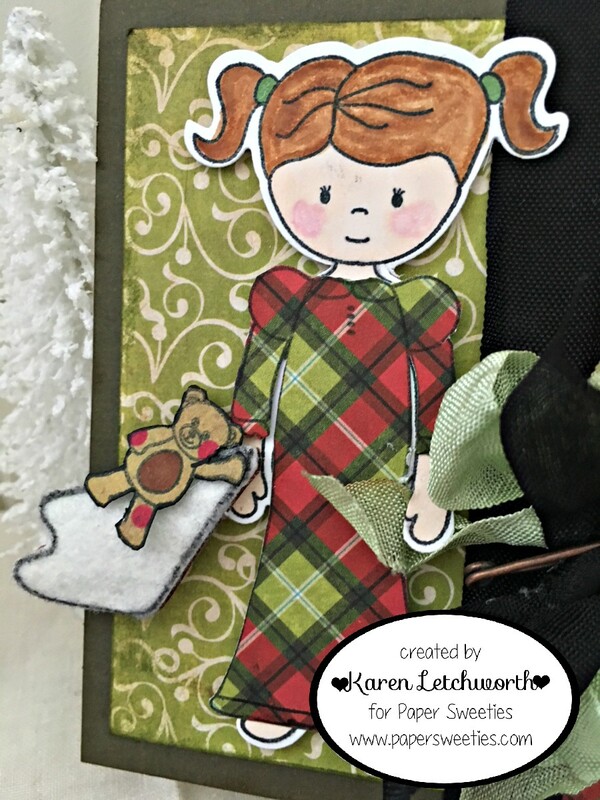 Emma's adorable Christmas pajamas, teddy bear and sweet wool blanket are all from the I Love You Stamp Set. I added a bow of the Licorice Seam Binding and Mint Seam Binding. There's a small piece of a Red & White Cenille Candy Cane tucked into my bow. Finally, I added a small tag from the Stitched Tags #1 Sweet Cuts in red, and then added another tag with a stamped sentiment (Sending Warm Huge & Kisses) from the Let It Snow stamp set. We hope that you will stop by to play along in this fun Christmas challenge. And for more inspiration, you can stop by these lovely blogs where my talented Paper Sweeties teammates have created something special for you. And....be sure to mark your crafty calendars and planners for the Paper Sweeties special event THE 25 DAYS OF CHRISTMAS. 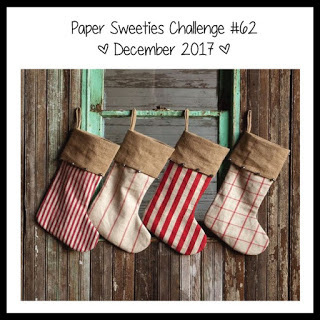 It starts today, and there's a special post each day December 1-25 and you can always find the links you need through this post on the Paper Sweeties Blog. This is a great time to do some Christmas shopping at Paper Sweeties. Don't miss out on any of the fun, my friends! 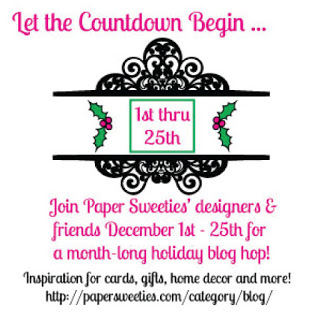 Every day December 1-25 will bring lots of great Paper Sweeties inspiration. 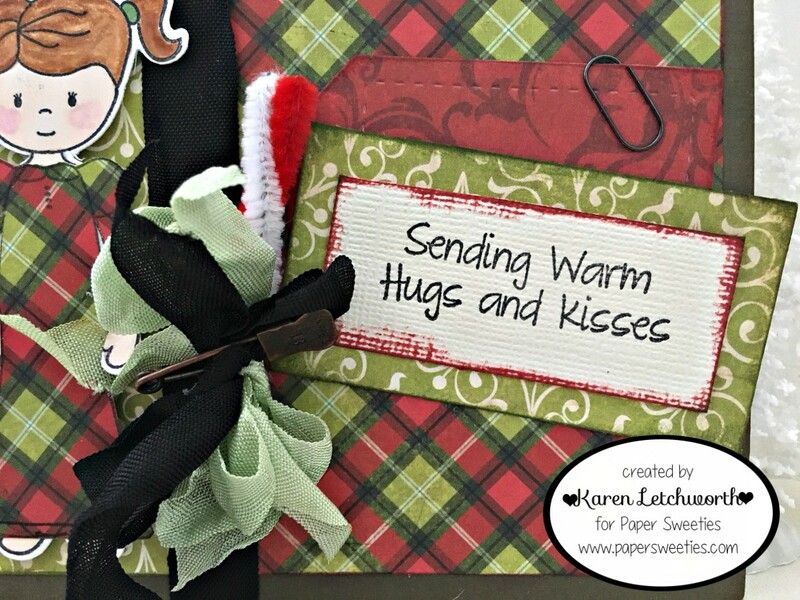 In addition to today's card, I will be sharing Paper Sweeties posts/projects with lots more Christmas inspiration for you all right here on my blog again December 2, 3, 4, 9, 17 and 23. That's a whole lot of Paper Sweeties goodness! I hope you'll stop by my blog, and the Paper Sweeties Blog, again real soon. 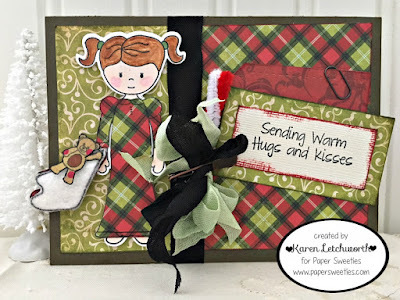 CropStop Challenge Blog - Challenge #34 - Anything Goes - I used Tombow Adhesive, Tim Holtz Distress Ink Black Soot, Green Grass and Brick Red and a Tim Holtz pin. So gorgeous! LOVING the PLAID!!!!!!!!!!!!!!!!! Emma is so darling in her plaid gown! Wonderful papers and design! Such a cute card, Karen!! Emma looks adorable dressed in her holiday nightgown - complete with her blankie and friend to get cozy with! What a great card with all the little extra touches like the bear's blanket. Very cute. Paper piecing is always such a great addition - I need to do it more often. Karen what a delightful card, you are such a talented crafter. Thank you for all of your support during the 25 Days of Christmas Tags! Aww...what a sweet Christmas card! Love the teddy and wooly blanket Emma is holding! So cute! So happy you joined us in the Cropstop link up -- I love seeing your name appear in the gallery! She is very festive in her plaid gown, and I love her little Teddy, too, Karen! Thanks for sharing your card with us at the Simon Says Stamp Wednesday challenge! So cute! Fab papers used, and love the little girl and her plaid dress!